Live dealer online casino games are not just a little better than their virtual counterparts, they are a whole lot better. So much better, than once you try live dealer casino blackjack, roulette, blackjack or poker – you’ll find the ‘virtual’ games very ordinary by comparison. Sure, the games are naturally a little slower (though faster than you might think) and the bets a little bigger – though the games are so much better in terms of entertainment that these concerns will soon feel trivial. First the pictures below each point to a different page covering a game found in live dealer format. These are detailed guides which include strategy and where the best versions of each game are found. These will open a new tab, so you can continue reading this page too. Next, you’ll find an overview of how live dealer casinos operate, and how these work independently from the casino brands. After that, you will find a general pros / cons of these streamed games – along with a word on the different formats you can find them in. Finally, each of the games is summarized, this is put here for players who like the idea of trying a live casino online, though have not yet decided which game(s) to try out. Where to Find the Best Live Dealer Online Casinos in 2018? Just like with slots and the ‘virtual’ casino software, most casino brands do not have their own live dealer studio. Instead the studios are owned and operated by independent companies such as Evolution Gaming and Vegas Technology. The casino brands license these games and integrate them into their software. This means you will access streamed live dealers through the same account without leaving your regular casino. Bigger casinos will sponsor their own tables within a 3rd party studio. These will be branded with logos and colors, and will have dealers wearing the casino brands too. Smaller casinos will share the ‘general floor’ games, which are unbranded. Players from many casinos will access these games. There are also special high-roller rooms at some casinos, where the stakes start high and go up to the levels enjoyed by the real casino high-rollers (think bets in the $ / €1000’s to €10,000’s). 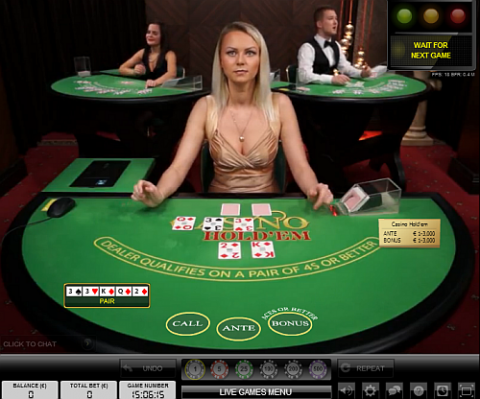 The picture below shows a standard view from a live streamed Casino Holdem game. You will see other tables in the background (these are live games), and the controls for betting around the frame of the window. At the bottom you are able to select your chip sizes, and toggle the chat / sound and other settings. You bet by clicking on the felt in the right place. This is timed, if you miss your chance for that hand then things move forward without you. In one-to-many games (where many players see the same hand) then if you fail to raise your hand will be folded, so you do need to pay attention. Other games such as Blackjack (which is played 7 handed) will wait a while for your action, though you will still need to pay attention so as not to slow down the games. Where are the Remote Studios? There are three main hubs for the studios. Streaming is improved by having these closer to your location. Central America: US Casinos are based offshore and the live dealer studios are located in nearby countries like Costa Rica. Eastern Europe: Latvia is a hotspot for live dealer studios, with several companies having dealers based there. This is a lower cost country, and the level of English and infrastructure are both excellent. Philippines / Asia: You’ll also find Asian studios, both for the Asian markets and for those from the West who want to play through the night. Some casinos will give you the choice of playing at the Asian or Western studios. Dealers are chosen for being sociable and attractive and are mostly female. You can chat with the dealers during play via a text option. Many times the dealers will reply (out loud, they do not have time to stop dealing to type). I find it amazing (and sad) that so many idiots choose to give the dealers a hard time if they lose hands. Please, if you see someone doing that report them via the software or otherwise call them out. There are 6 main types of game currently offered. Each one is described below, along with a little information on the variations and bets available. 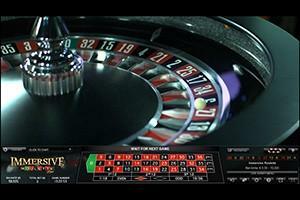 #1 Live Dealer Roulette: This classic works really well in live dealer format. The main thing to remember is that the spin does not wait for you to be ready. You’ll see a timer and can click to place your bets the same as on any online roulette game. Some studios offer a choice of US / European wheels, and even offer the ‘racetrack’ betting surface with an additional click. I recommend the ‘Immersive’ roulette for non-US players. This is a high-tech variation, featuring special effects and a slow motion replay. Bet sizes are from 50c and up for numbers, with even money chances generally having a $5 minimum (though you can find $2 minimums). Find out more in this Immersive Roulette article. #2 – Live Dealer Blackjack: Most of the streamed games are played with one hand shared by all of the players. Blackjack is played at a 7 handed table, with each player making their own decisions. This is very realistic, which unfortunately sometimes includes players who are slow making their decisions! Stakes are usually $5 minimum (with very high top ends). You will find more Blackjack tables than any other game. Side bets are also offered (Perfect pairs and variations of this). This article covers live dealer blackjack for US Players. #3 – Live Dealer Casino Holdem: This game is loosely based on Texas Holdem and is played one-to-many. All players bet on the same hand, which will continue to the end even if you choose not to bet after seeing the flop. Aces or better is offered as a bonus side-game. Your ante will be from $1 and up, with the raise always being 2x the ante. Find out more about Live Dealer Casino Holdem Strategy. #4 – Live Dealer 3-Card Poker: This will usually be called ‘tri-card’ or ‘triple card’ poker outside of big casinos, due to trademarks on the original name. This is a simple poker game and a very popular one where offered. Again it is played one to many, and again there are side bets – in this case ‘pairs plus’ is considered by most players to be a natural part of the game. This article covers 3 Card Poker Strategy. #5 – Live Dealer Baccarat: This is popular thanks to the low house edge and image of a game enjoyed in the exclusive high roller rooms of brick and mortar casinos. Again it is played as a one-to-many game, and works well in this format thanks to the simple betting. Pairs side bets are usually added as an extra. $5 minimums are the normal bets here, and again many casinos will allow you to bet into the $1000’s. #6 – Live Dealer Sic Bo: This is only available at selected Asian live dealer casinos. Here you are betting on the roll of 3 dice, and will have a lot of bets and combinations of bets to choose from – ranging from even money chances to real long-shots (3x 6’s for example). Like roulette you will get to bet on a ‘virtual’ surface with the standard layout – with a rebet for when you find your favorite pattern. More details of live streamed Sic Bo Games in this article. #7 – Live Dealer Caribbean Stud: This one is a personal favorite, you are dealt 5 cards and need to make a better hand than the dealer (who needs to qualify) to get paid. There are tiered payouts for progressively better poker hands, and a side bet based on the first 5 cards and the dealer’s ‘upcard’ with some very large payouts. This game has been a live casino favorite for many years. Find out more about live dealer Caribbean Stud here. That’s all for the moment – I am looking forward to seeing who comes up with some fresh new games first. As I said in the introduction, streamed games with real dealers are just so much better than the virtual versions that you’ll find them becoming your go-to tables. That said, there are some negatives. First up, the stakes are often higher compared to the virtual games. This is needed to pay for the dealers / studio overheads (they would not be able to make it work with everyone betting for cents). You also can’t try out the games for free – though you can sit and watch at most casinos to get an idea of how each one works. The other main negative is that they are slower, particularly Blackjack, where you need to wait for other players. Some casinos do allow multiple games at once, which speeds things up nicely. With the other games, which are one-to-many, you’ll need to pay attention, if you do not act in time you might find a good hand gets auto-folded. On the positive side you can often find some extra bonuses coming your way. Since the casinos know that once you try the live games, you’ll love them, they can afford a small ‘loss leader’ to get people to try. This can be a free $5 chip, $25 rebate if you lose on your first attempt – or another kind of bonus… taking advantage of these can get you off to a winning (or at least not losing!) start. You can access live dealer casinos via a regular casino download, special apps (not all casinos have these, though it is becoming fashionable to have dedicated apps just for this) or via your browser window. Playing live dealer games is not yet phone compatible, there is too much going on to make it work on a 5 inch or smaller screen. You can enjoy them on your iPad or Android tablet with touch-screen controls, or on a desktop / laptop. There is no special task here, it is as simple as finding a casino with a great live dealer studio integrated into it, signing up and trying out the games. Which casino you choose does depend on your location (mostly US or outside, though several more countries now require licenses.) Check out the recommendation below – you’ll soon see for yourself that once you try live-streamed online casino games, there is no going back!